Ken availble to play once more! 909. What does this number represent? It’s the frequency you can find Radio Five Live on, its how many seasons my father has been playing for and it’s how many sandwiches Oscar would ideally have at tea. And as of yesterday, it’s the most wickets any one player at Twyford and Ruscombe CC has taken in the club’s history. That man is Nic Downes, whose two wickets on Sunday saw him overtake his brother David as the club’s leading wicket taker. And of course final wicket fell in classic fashion – the bamboozled batsman trying to launch the delivery into Stanlake Park and being bowled. For their second outing of the season, Twyford welcomed visitors Bracknell to Stanlake Meadow on Sunday full of hope. 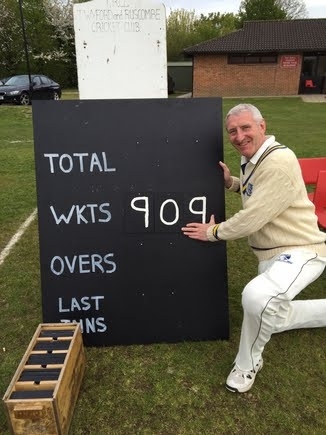 Bracknell’s batsmen were falling quickly, and there was a danger the record-seeking man of authority may not get to bowl (a point he made a number of times in the slips to Skipper Hugh Fort). Of course he did get to bowl, first prompting a top edge to Teal at point, and then ultimately bowling the batsman who had already shown a fondness for the massive skier. Nic’s cricketing powers not only were with the ball, but he ensured the Sunday side batted out their innings to secure a well-earned draw that day.